Following an address by Margaret Chan, WHO Director-General, that reflected on the global development agenda after 2015, debate on the second day of the sixty-second session of the WHO Regional Committee for Europe was dominated by Health 2020 and its evidence base. In May 2010, the World Health Assembly adopted the WHO Global Code of Practice on the International Recruitment of Health Personnel. Globally, 50–60 countries cannot deliver even basic health services owing to a lack of trained staff. The WHO European Region includes both source and recipient countries of health workforce migration, and the goal of the briefing was to foster commitment to implement this voluntary code. Europe's ageing population will further increase the need for a skilled health workforce in the coming years. Dr Bjørn-Inge Larsen, Director General for Health and Chief Medical Officer, Norway, explained that Norway is working to implement the Global Code, but anticipates health workforce shortages from 2020. The Republic of Moldova, a country experiencing an exodus of trained health professionals, launched a project last year to stem the “brain drain” from the country, and encourage circular migration, explained Dr Andrei Usatîi, the Minister of Health. Mr Lieven De Raedt, Attaché, International Relations Department of the Ministry of Public Health, Food Security and the Environment, Belgium, noted that his country, together with 24 Member States and WHO, is also taking steps to address the issue, developing a charter on the recruitment and support to the development of human resources for health in partner countries. Several nongovernmental organizations expressed their support for the Global Code, and commitment to work with WHO on the issue. Dr Chan's address to Member States began by reflecting on the changing health environment, and the work being done to address the risk factors behind the epidemic in noncommunicable diseases. The Director-General commended the excellent work achieved in implementing anti-tobacco legislation, but also recognized the challenges, in a global world with strong private industry interests, in tackling issues such as obesity through, for example, reducing the availability and advertising of processed energy-rich, density-poor foods. Her address then focused on two main issues that she considers vital for Member States to “get right”: WHO reform, and placing health on the post-2015 development agenda, the end date for the Millennium Development Goals. Today's world has become more complex, and the threats to health stem from “radically increased interdependence and interconnectedness”. Recognizing this new reality, Margaret Chan appealed to countries to develop policies that make equity an explicit objective, as they “do more to improve health outcomes and promote social cohesion than money alone”. Looking beyond 2015, she identified universal health coverage as one of the best ways to respond to current challenges. “In my view, universal coverage is the single most powerful social equalizer. At a time when policies in so many sectors are actually increasing social inequalities, I would be delighted to work with you to see health lead the world towards greater fairness, in ways that matter to each and every person on this planet,” concluded Dr Chan. The Nineteenth Standing Committee of the Regional Committee (SCRC) presented the report on its work in 2011–2012. 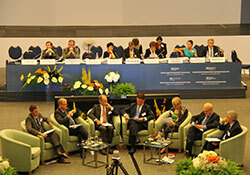 Five sessions and three teleconferences had been held including one session open to all Member States. Chairperson Dr Lars-Erik Holm, of Sweden, described the input the SCRC had had into the main items on the Regional Committee agenda: Health 2020, the public health action plan, the strategy and action plan on ageing, the role of the geographically dispersed offices and WHO/Europe’s country strategy. He emphasized the importance of reaching consensus in the development of the Health 2020 documents and ensuring they were tailored to the right audiences. Dr Holm also mentioned requests from Member States that were already being implemented, such as the inclusion of the financial implications of resolutions and the increased transparency of the SCRC sessions. A further request was made for feedback on the effect of the new criteria for membership of governing bodies and committees. Ms Dessislava Dimitrova, Vice-Chairperson, highlighted the value of the SCRC’s rolling agenda, which enabled longer-term planning, of particular value in the development of a mental health strategy and action plan, a health information strategy for Europe and a new communications strategy for WHO/Europe. She also stressed the usefulness for the SCRC’s work of hearing the staff perspective from the WHO/Europe Staff Association’s representative. This agenda item began with an introduction to the new European health report 2012 by WHO/Europe, followed by a panel discussion on the evidence and studies informing Health 2020. Addressing plenary, Dr Claudia Stein, Director of the Division of Information, Evidence, Research and Innovation, shared some of the key findings of the European health report 2012, to be published later this year. Almost 70% of the population in the WHO European Region live in urban areas, and 8% have migrated to another country. In 2010, average life expectancy was 76 years and this has been improving over time, although inequalities have increased across the Region. A gender divide in life expectancy also remains: in some countries, women live 10–12 years longer than men on average. Life expectancy for men is accelerating, however, at a faster rate than for women. Consumption of alcohol is increasing, whereas smoking rates are falling, although not in every part of the Region. Dr Stein concluded her presentation by explaining the process of identifying and analysing targets to set for Health 2020. A working group of Member States had reviewed over 50 possible targets, and reduced this number to 6. If countries agreed to these targets, then work would continue over the next 12 months to establish about 20 indicators. During a panel debate in plenary, authors and coordinators of the background studies supporting Health 2020 provided brief synopses of their main findings. Professor Sir Michael Marmot, Institute of Health Equity, University College London, United Kingdom, and chair of the consortium developing the report on social determinants of health and the health divide in the WHO European Region, described how 13 task groups had reviewed the way countries can apply the best evidence to address the social divide, the health gradient and specific health issues across the WHO European Region. Noting that the European Region contains the countries with the best health and narrowest health divide, he cautioned Member States not to be complacent. The study found that not all countries had enjoyed all the benefits; in many cases there were growing inequities within countries and the financial crisis had put additional strain on countries. Professor Marmot concluded, “A reduction in health inequities should be one of the main criteria for assessing the effectiveness of health systems and governments as a whole.” Echoing the sentiments of Dr Margaret Chan, he appealed to countries to “put justice and equity right at the heart of policy-making”. Professor Ilona Kickbusch, Director, Global Health Programme, Graduate Institute of International and Development Studies, Geneva, Switzerland, is the main author of the study on governance for health in the 21st century. Speaking candidly, she explained, “Ministries of health have to change.” The increasing global power of markets, the financial crisis, and the growing voice of civil societies are factors that mean ministries of health and governments must involve more stakeholders in policy-making now, according to Professor Kickbusch. She elaborated that the role of health had changed, now accounting for up to 10–15% of gross national product and 10–15% of the workforce, a major exporter of goods and an element of trade and technology. Identifying the impact health has on other factors and its position in society is very important. Summing up, Ilona Kickbusch explained that in addition to addressing the social determinants of health, ministries of health had to find mechanisms for interacting with industry and “the commercial determinants of health”, and appeal to politicians to shift from political ideologies to values and thereby influence “the political determinants of health”. Mr Mark Pearson, from the Organisation for Economic Co-operation and Development, commented, "We can make a fabulous economic case for investing in health.” Using “best buy” interventions to address noncommunicable diseases, he explained that some policies, such as raising taxes on tobacco, smoke-free policies and media campaigns, are cost saving: they save more money than they cost to implement. Other interventions, including bans on tobacco advertising, introducing minimum prices for alcohol, drink–driving laws, decreasing the salt and fat content of foods and food labelling, are cost effective. Dr Roberto Bertollini, Chief Scientist at WHO/Europe and WHO Representative to the European Union, briefed plenary on past resolutions and declarations adopted by the WHO Regional Committee for Europe from 1990 to 2010, to identify common themes and omissions. Over that period, 82 resolutions, 13 declarations and 3 legally-binding documents had been adopted. Many of these documents referred to the need to strengthen partnerships or enhance capacity, but few made reference to the leadership role of the ministry of health or to vulnerable groups. Resolutions and declarations often overlooked prior progress made, or the lack of it, and previous commitments. Dr Bertollini questioned the sustainability of such a large number of commitments by countries over the years, not just in terms of implementation but also of monitoring and evaluation. He concluded that Health 2020 created a framework for the values and issues of past resolutions, but the Regional Committee should reflect on its governing mechanisms. During this lunchtime session, delegates were briefed on WHO's financial mechanisms. After the panel debate on the evidence base for Health 2020, Zsuzsanna Jakab presented the policy itself. She reminded delegates that Health 2020 was developed with the active involvement of all Member States and other partners, in what she described as “an exciting, engaging, learning process”, which involved “the unprecedented collection of evidence, studies, experience and stakeholder review”. Over the past two years, opportunities for comment were provided in three meetings of the European Health Policy Forum in Andorra, Israel and Belgium, a conference in Israel, several discussions within the SCRC and a written consultation with Member States. “It has been built on a proud and long history of public health policy development,” she added, “but we now need to reach higher and broader”. Ms Jakab outlined what the policy framework contained for various stakeholders – ministers of health, prime ministers and other sectoral leaders, public health agencies, advocates and academics, health professionals, partner agencies, and civil society – and listed what WHO/Europe would do to support this work. Describing the delegates as the “gatekeepers of their nations’ health” who were eager to work in a complex reality, and the document as “a policy fitting its time”, Agis Tsouros, Head of Policy and Cross-cutting Programmes and Regional Director’s Special Projects, assured them that Health 2020 was designed to be helpful to everyone. As an integrated policy, it interconnects to the underlying evidence, recognizes that each country is at a different starting point, and also provides for monitoring and evaluation. One of several mechanisms put in place to facilitate implementation is a new Health 2020 interactive web site. In their responses, Member States congratulated WHO/Europe on the successful development of the Health 2020 policy framework and strategy, describing the creation of such an umbrella strategy as an important milestone, which gives the European Region a leading role in tackling health inequalities and covers all areas of health of concern to both Europe and the world. It was an achievement, but also a commitment and a challenge. A total of 30 delegations took the floor and pledged their support to the Health 2020 policy. Many told how they had integrated, or intended to integrate, the values and principles of the Health 2020 policy into their national strategies and policies. smaller states’ contributions to an analysis of the implementation of Health 2020.
the strategy and action plan for healthy ageing in Europe, 2012–2020.